Jubeat Plus (iPad) & US Version: Jukebeat Released! Konami released the US Version on August 10th! Song packs are 4 songs for $3.99 (US) or 450 Yen (JP). It works amazingly well on the iPad's massive screen and replicates the feel and gameplay of the arcade cabinet surprisingly well. If there was ever a reason to own an iPad, this would be it. Let me borrow your Japanese account. I followed this guide to make a Japanese iTunes account. Worked for me! You need to buy a gift card for that method and I don't really want to order one and wait two weeks for it to get to me just to play a free game. Just wanted to mention that it is not necessary to add a gift card if you use the Free App method. Got the game now, thanks. It's really fun but it feels pretty funny compared to the arcade machine. Hopefully the DLC will eventually be uploaded somewhere. Someone on Bemanistyle is trying to share the extra music files right now, but it seems like trying to copy them from one device to another results in the game immediately crashing upon attempting to boot into a song. Hopefully someone else will have better luck with distributing the extra tracks. I couldn't wait and ended up ordering a prepaid card from JList. Saw that just now, you have to put the gen files on your device before opening it for the first time, so the game can make a .plist and all that. It worked for the DDR S+ DLC too. I've considered buying an iPad for the purpose of playing this. How good is it? How good are the songs? Is it just like the arcade (with various difficulties)? Three difficulties per song, note charts, music, and graphics are arcade identical. There's no unlocks but it comes with all the markers (button animations) available from the start. The base game is free but only comes with three songs. More songs are purchased in packs of four for 450 yen each. You need a Japanese iTunes account and a way to pay for things with it (either a credit card registered to a Japanese address or a Japanese iTunes giftcard, available online) to buy those packs. EVERY song from the AC version was available in demo builds, so there will be a ton of DLC later. It's as fun as the arcade game, just a bit smaller and harder to play since you can't really use your other fingers and your hands cover more of the screen than at the arcade. Unless you're willing to buy a lot of song packs or wait until we see them uploaded, I wouldn't lay down the money for an iPad just to play this. It depends on how much playing Jubeat is worth to you. For me, personally if I didn't already own an iPad, I would've more than likely purchased one by now just to play this. But there's a ton of other great games you can download like CAVE shmups if you're into bullet hell, or this korean music game called Beatrider that generates notecharts for any MP3 you upload to it. The difficulty can get pretty manic (Almost IIDX manic, but not quite) at the higher difficulties too. It's an iPhone/iTouch app though, so it doesn't natively support the iPad's resolution. It'll just get artificially stretched to fill the screen. 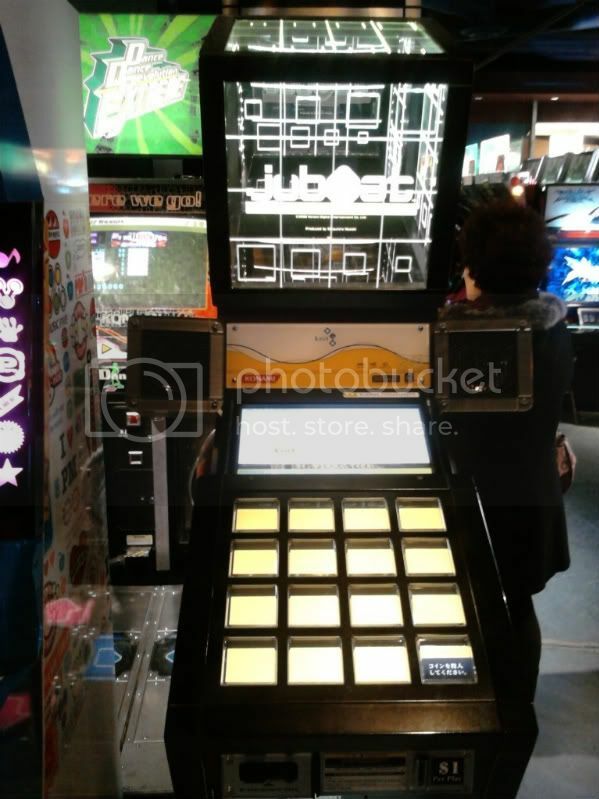 Like Davyn mentioned before, there's also a DDR game for it also produced by Konami, and Namco's Taiko no Tatsujin is also available for download on it. Those games are technically free, although just like with Jubeat Plus, you need to spend extra money to purchase the additional music packs. But as for the game itself, Davyn already highlighted everything there is to know about the game. It's about as close to the arcade experience as you can get without actually buying the cabinet. Plus, it's portable. Hmm, all those other music games sound fun too. Have either of you tried this out yet? Yep, I downloaded that on the day of its release. It's a crappy clone of Jubeat with annoying slide note mechanics that are almost impossible to sightread, and your only hope of landing them successfully is by rote memorization. I only tried playing Poker Face on it, but the timing on that song was TERRIBLE. I find it especially bizarre that the game includes a timing correction option. This makes sense on console games like IIDX where no one has the same TV display and sound systems. But this game is on the iPad, so they should know precisely what kind of hardware they're dealing with, allowing them to bypass the need for audio/video calibration entirely. A large majority of the notes didn't feel anywhere remotely near rhythm, and I had better luck simply muting the game and playing that way than actually trying to time the beats with the notes. Just stick with Jubeat Plus, or even iBoogie if your device is Jailbroken. I got an iPad for Christmas and one of the first apps I got was Jubeat Plus. My wife and I have been playing this pretty non-stop on the iPad, and even took it on vacation with us to play. We have 5 or 6 of the song packs from a Japanese iTunes gift card, and it's awesome! It is weird how it's much smaller and not actually buttons; so the next time we go to Canada we will be horrible at the actual machine version until we readjust. It's crazy fun though! I must be the only person that completely isn't impressed by iPad Jubeat. I've spent a LARGE amount of time on Jubeat arcade cabs and playing it on the iPad was almost as much a non comparison as playing DDR on a softpad. Fun novel concept yes, but I couldn't take it seriously lol. I've only got to play it for about 7 sessions in Canada on one day. The iPad version is pretty darn great when you don't have daily access to a real cabinet. Which is why I compared it to home version DDR :3. The novelty is off after extensive time on the real thing. ...I've never played/seen jubeat in this hemisphere though. Any idea what mix they had up there? They've got Jubeat Knit now. Though it's funny that one of the last unlocks in Knit *Sweet Rain* is one of the free songs for jubeat plus. I will be driving up this weekend. Will definitely check out Knit. I don't know you skill level, but if you don't have an e-amuse card, purchase one before playing. A good 50% of the tracks in the game are e-amuse unlockables. There no eamuse in north America anyway. App updated to version 2.0 with iPhone and iPod touch support. For what it's worth, Knit is in great condition and played wonderfully! It'd almost impossible to play on an iPhone anyway. It's still 4x4 buttons with the same patterns as arcade so any 3+ (or 2 depending on the buttons) hits are pretty much impossible. I had thought they would redo it in a 3x3 layout.